The skies may be clearer lately but it doesn’t mean that the whole crisis that had Malaysians and Singaporeans gasping for fresh air is over. The haze period is expected to continue until September this year and to monitor the condition, Google has launched a SEA Haze Crisis Map for the public to keep an eye on the air quality levels. On top of being able to see the air quality in different states across Malaysia and Singapore, the SEA Haze Crisis Map also shows the hotspots in Sumatra so you can predict how the haze situation will be like in the upcoming months. The data are all retrieved from the Department of Environment, Malaysia; National Environment Agency, Singapore, and Nasa Aeronet Ariel Images. 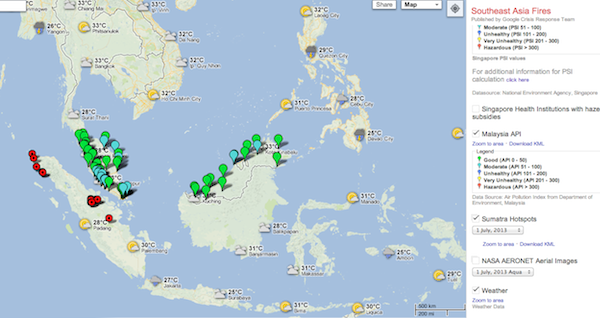 Visit http://google.org/crisismap/2013-se-asia-fires now to check out the Crisis Map from Google.